One definition of “mother” is “nurturer.” A good mother puts her children’s needs before her own to insure their health and welfare. “The month of April arrives and so do the babies. The raccoons appeared in droves. Containers for them started to fill the living room, formulas were made, the babies would be fed four times a day, the last feeding at midnight. Hundreds of used towels needed to be washed, dried and folded for the next change (after every feeding!). 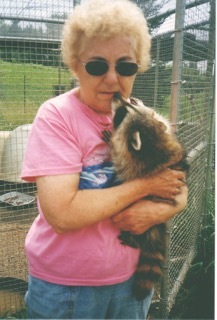 One night in May, Donald decided to count the raccoons as we had lost track – he counted 150! In addition, skunks, mink, weasels, opossums, fawns, foxes, porcupines and woodchucks were arriving. We were overwhelmed and exhausted. However, our dedicated volunteers saved us. God bless them! “Though raccoons are in the majority, they don’t usually present the challenges that we face with the fawns. One year we received 20 fawns, requiring several trips to the veterinarian with broken bones, open sores and coccidiosis infections. Seven fawns died from their wounds, received either by vehicle hits or predator attacks. Some won’t nurse from the bottle, making it necessary to use a syringe to administer the milk. We carry on. “Over the spring and summers months the animals, eventually moved to outside pens, grew and got fat. Many were released in late August to their natural habitats. September is the release time for the raccoons. Could we find enough spots to release 150 of them? We did it, at last! The raccoons react differently when taken to the chosen release sites. Some left the carrier, happy to roam, others hesitated, terror showing in their eyes, but, eventually, decided to explore their new surroundings. We are asked, “Are you sad to see them go after spending so much time caring for them?” Yes and no – we do wonder how they are faring, but know they are where they belong, enjoying the things they naturally do in the wild. Memorial donations may be made to Kennebec Valley Humane Society, 10 Pet Haven Lane, Augusta, ME 04330.